Oatmeal is a wonderful, warm, delicious way to start your day, but the same old flavors can get a little boring and lead to the "mush" type nickname my grandpa gave it. My grandparents were married for 65 years and, at least in those years I can remember, Grandma made oatmeal nearly every day. I would have called it mush too! These recipes are sure to end any oatmeal blues you may have been feeling. Let's just say, this isn't your Grandma's oatmeal! 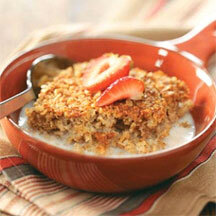 In a large bowl, combine the oats, brown sugar, baking powder, salt and cinnamon. In another bowl, whisk the eggs, milk and butter. Stir into oat mixture until blended. Pour the milk and salt into a saucepan, and bring to a boil. 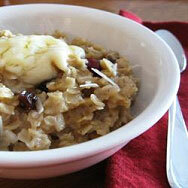 Stir in the oats, maple syrup, raisins, and cranberries. Return to a boil, then reduce heat to medium. Cook for 5 minutes. Stir in walnuts and coconut, and let stand until it reaches your desired thickness. Spoon into serving bowls, and top with yogurt and honey, if desired. Serves 6.